1. Preheat oven to 400°. In large oven-safe skillet, heat oil over medium-high heat. Add bell pepper and onion; cook 5 minutes, stirring occasionally. Add garlic and chili powder; cook 1 minute, stirring frequently. Add beef; cook 7 to 8 minutes or until beef is no longer pink. 2. Stir in salsa, corn and water; heat to boiling. Reduce heat to low; cook 10 minutes, stirring occasionally. 3. Meanwhile, prepare cornbread mix according to package directions, adding 1/4 cup additional milk; stir in 1/2 cup cheese. 4. 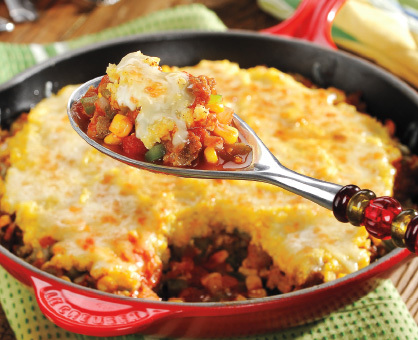 Spread cornbread mixture evenly over beef mixture in skillet. Bake 15 minutes or until cornbread is cooked through, sprinkling with remaining 1/2 cup cheese during last 5 minutes of baking.